Is India's Hindu Right Getting More Assertive? Members of a right wing Hindu party force a Muslim to eat during Ramadan. Are some elements of the Hindu right becoming more brazen in their actions? This might explain the behavior of parliamentarians belonging to the Shiv Sena, a right-wing Hindu party based in the western Indian state of Maharashtra. It has emerged that last Thursday, certain parliamentarians forced fed a Muslim catering supervisor during the month of Ramadan, when Muslims normally fast. The incident took place last Thursday in an official guest house in New Delhi after the lawmakers got agitated due to being served poor quality food. Television footage revealed a young Muslim surrounded by a group of legislators. One of them, Rajan Baburao Vichare, made several attempts to push a chapati into the mouth of the caterer. No one there made any attempt to stop this from occurring. When news of the incident broke this Wednesday, it caused an uproar in Parliament. 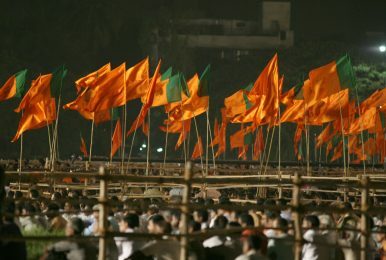 The Shiv Sena is a regional ally of the ruling Bharatiya Janata Party (BJP), and both organizations have roots in the Hindu right and are linked to a Hindu organization known as the Rashtriya Swayamsevak Sangh (RSS). However, while the BJP has become a mainstream national party, the Shiv Sena lurched towards xenophobia by acting out against linguistic and religious minorities. The Shiv Sena’s top leadership have all been indicted for killing hundreds of Muslims in riots in Mumbai in 1993. Last week’s incident has caused alarm among many Muslims in India because it is not seen as an isolated incident. Additionally, some liberals in India are also concerned. Both groups are worried that the rise of the BJP has emboldened right-wing Hindu forces. For example, last week, a prominent leader of the Hindu right, Pravin Togadia, issued a veiled threat to Muslims. He reminded them of the 2002 Gujarat riots as well as last year’s Muzaffarnagar riots, connecting these incidents with Muslims alleged lack of respect for Hindu sentiments. Togadia’s statements came a couple of days after another statement by Ashok Singhal, president of the Vishva Hindu Parishad (VHP), a right wing Hindu organization. Singhal said that after the 2014 elections “[the] tables have turned against Muslims” adding that “if [Muslims] keep opposing Hindus, how long can they survive?” On the national level, Amit Shah, who is known to be strongly pro-Hindu, was recently appointed the President of the BJP. Amit Shah was the Home Minister of Gujarat during the 2002 Gujarat riots. Maharashtra will go to the polls in a few months, in order to elect a state government. It is possible that the BJP and Shiv Sena want to consolidate their vote in the state. In the recent national election, the two parties, in alliance, won the majority of 48 parliamentary seats they contested. The Hindu right’s actions seemed to be aimed at polarizing voters in Maharashtra along religious lines. A few weeks ago, a Muslim professional in Pune was murdered by Hindu radicals after uploading a derogatory picture of Shiv Sena leaders to the internet. The silence of India’s political leadership against this rising rhetoric is disturbing. After becoming prime minister, Narendra Modi assured the nation that he would work to end discrimination and work for communal harmony. However, Modi has not commented on the remarks of Hindu right wing figures or said anything about the recent force-feeding incident. This could further encourage the Hindu right.